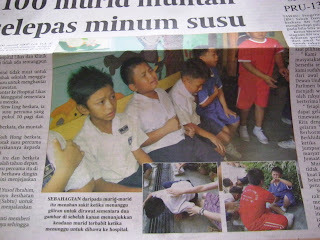 Our local government has been giving out free milk to the pupils since I was in Primary School, I do not know whether other States in Malaysia doing the same or not. We appreciate the good gesture from the government in providing nutritious milk to the students over the years. However, milk is a very perishable item, it turns bad or stale easily. 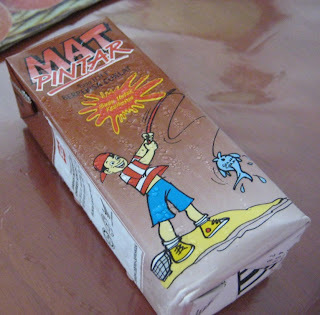 It will do more harm than good if the cartons of milk turn stale due to improper handling during storage and logistic. Our girls like to keep these free milk in the fridge and consume them while cool. There were two occasions that Crystal have had diarrhea for no reasons because we were having the same food, why only her having stomach upset?? After chit chatting with parents at school, I gathered that the free milk from school was the culprit. I have since stopped my girls from taking them altogether since last year. 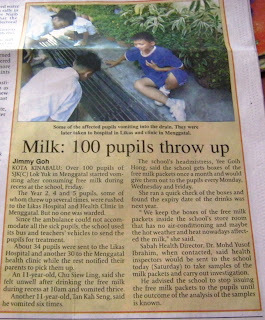 It was reported in the News today that 100 pupils throw up after consuming the free milk from school, it was no surprise to me as my girl has suffered from it twice before. 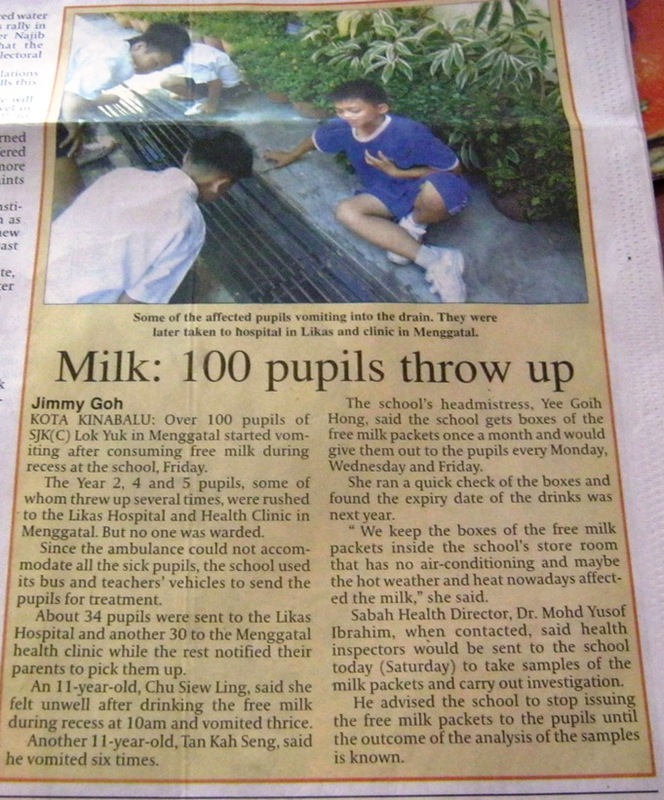 The pupils are suffering from stomach pain and vomiting, all this can be avoided only if the parties handling these milk are sensible enough to make sure they are kept fresh as required. I have seen a normal lorry truck delivering milk to the school, these milk will then placed at the corridor in the school for many days before they are distributed to the pupils. The Health Ministry should consider having these milk be transported by a refrigerated truck and distributed to the pupils as soon as the cartons milk arrive to the school. Pearl was asking for our permission to drink this packet of milk last night which she brought back from school and kept cool in fridge, we were glad we stopped her from drinking it, or else she could be suffering from stomach upset too. I showed to my girls the news so that they are aware of it. yes, I remembered those days I was given free milk too but it's those Dutch Lady milk.. frankly speaking, it make me wonder where these milk come from since it's not carrying any brand name, and with a 'superman' in packaging..
think those days quality and handling were much better than now..
Hi Cynthia, this milk is a local produce. My boy also gets free milk too starting this year. He has to finish the milk in school and is not allowed to bring it home. I have no clue as to how the packing looks like but according to my boy, it's manufactured by Dutch Lady though I am not too sure.